Planning a dinner menu is always an experience at our house. My boyfriend Brian is the chef in our kitchen and each meal is well thought out and that includes the wine. Recently, I stumbled across a kosher wine and we decided it would make a nice accompaniment to our lamb dinner. In tasting this kosher wine, we were not familiar with Karmei Yosef wines. We discovered that this Israeli wine bearing the Bravdo label has many fine wines and the Bravdo’s Merlot 2012 happens to be the one we were fortunate to enjoy. This medium to full bodied wine was aged twelve months in French oak barrels and provided a deep dark ruby red clear color. We were able to pick up the red berry and vanilla flavor, where two other guests picked up on herbs with pepper and anise—we didn’t. I personally liked the soft silky tannins with a smooth finish. 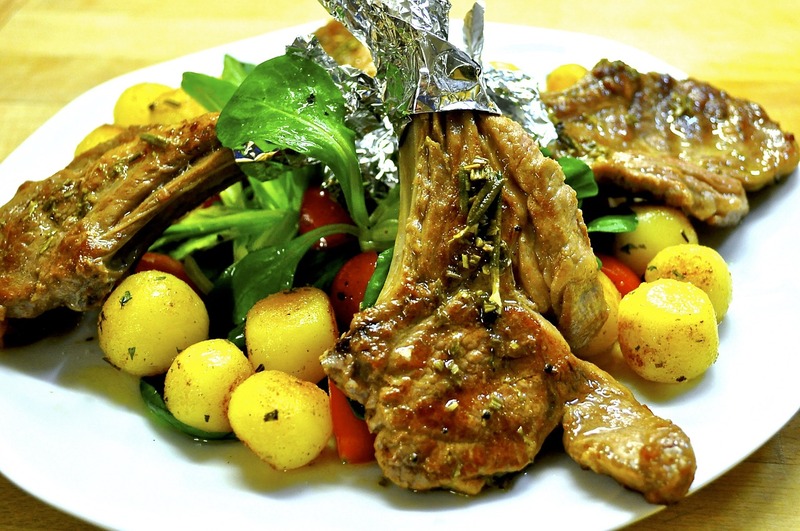 We served it with rack of lamb, but it would pair well with duck, lamb, or steak. Bravdo’s Merlot 2012 has a SRP of $32. In looking on the Internet, I see it retailing from $26.99 to $34.99. In any case, I would highly recommend and I know we will enjoy this wine again. Several years ago, Professor Ben Ami Bravdo started putting his enormous accumulated store of winemaking know-how into practice. Together with his former student, Professor Oded Shoseyov and his son-in-law Zori Arkin, the son of a veteran vine growing family, he established a boutique winery. The Shoseyov and Arkin families started cultivating wine grapes 130 years ago. The winery is located at the heart of the vineyards, near the village of Karmei Yosef, allowing the wine production process to begin immediately after the grapes are manually harvested with meticulous care at dawn. The wine is produced according to the combined expertise and knowledge of Professors Bravdo and Shoseyov, who use the advanced technology that guarantees excellent results. Karmei Yosef is in the Judean plains and the vines are planted on heavy, rocky limestone, known as being excellent for growing high quality wine grapes since the time of Solomon’s kingdom. Over the years and with the rising awareness of the importance of grape quality in wine production, varieties were enhanced and agricultural methods developed to ensure the supply of fine wine grapes. The 250- dunam vineyard contains Cabernet Sauvignon, Merlot, Shiraz, Chardonnay and Cabernet Franc. When you try this wine, we would enjoy hearing your comments. I personally like to know if someone picks up different flavors than I do or what they do or don’t enjoy. PreviousLet the Good Times Roll in Lafayette, Louisiana!